^ "Bob Turley Was Happiest Of A Happy Crew". Ocala Star-Banner. Associated Press. October 10, 1957. p. 4. Retrieved January 4, 2016. ^ a b c d e Eck, Frank (August 11, 1955). "Seeking Bob Turley Yanks First Hired His Uncle, Then Finally Got "Right Turley"". Gettysburg Times. Associated Press. p. 3. Retrieved January 4, 2016. ^ a b c d e f g h i Lalonde, Roger (April 1, 2013). "Bob Turley, Cy Young winner and seasonal Marco resident, dies at 82". Naples Daily News. Retrieved September 21, 2013. ^ a b c d Fraley, Oscar (June 4, 1958). "Turley Proof Speed Ball Isn't Enough". The Milwaukee Sentinel. United Press International. p. Part 2, Pg 5. Retrieved January 4, 2016. ^ "Wichita Wins 3rd Straight". The Telegraph-Herald. Associated Press. September 15, 1950. p. 13. Retrieved January 4, 2016. ^ "Texas League's All-Star Game Set Tonight at Houston". The Bonham Daily Favorite. United Press International. July 12, 1951. p. 4. Retrieved January 5, 2016. ^ a b "Bob Turley, Although Losing, Is Standout Twirler for Browns". The Southeast Missourian. Associated Press. September 17, 1953. p. 7. Retrieved January 4, 2016. ^ Phlegar, Ben (September 17, 1953). "Browns' Bob Turley Has Struck Out 48 Men In 47 Innings". Waycross Journal-Herald. p. 2. Retrieved January 4, 2016. ^ Hirsch, Arthur (April 14, 1994). "Where Are They Now? Turley's '54 home opener as artful as his Fla. home". The Baltimore Sun. Retrieved September 21, 2013. ^ a b c d e Duncan, Ian (March 30, 2013). "Bob Turley, former Orioles pitcher, dies". The Baltimore Sun. Retrieved September 18, 2013. ^ a b "Bob Turley Adds Curve To Skills". The Tuscaloosa News. Associated Press. June 22, 1957. p. 6. Retrieved January 5, 2016. ^ a b Marin, Whitney (June 17, 1955). 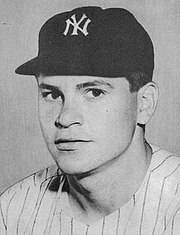 "Like the Prairie Flower: Bob Turley of Yankees Seems to Grow Wilder by the Hour". The Milwaukee Journal. Associated Press. p. 2. Retrieved January 4, 2016. ^ a b c Chandler, John (October 10, 1957). "Bullet Bob Turley Was Happiest Guy In Yankee Room". Ottawa Citizen. Associated Press. p. 15. Retrieved January 5, 2016. ^ "Turley Another Bob Feller?". The Milwaukee Sentinel. Associated Press. April 23, 1954. p. 6, part 2. Retrieved January 5, 2016. ^ Heft, Herb (July 11, 1954). "Is Bob Turley the New Bob Feller?". St. Petersburg Times. p. 19. Retrieved January 5, 2016. ^ a b "Baseball's Biggest Trade: A Revisionist's Recounting". Society of American Baseball Research. Retrieved September 18, 2013. ^ "Bob Turley Is Sad, Pleased And Surprised". The Day. Associated Press. November 18, 1954. p. 34. Retrieved January 5, 2016. ^ "Yankees Get Bob Turley in 12-Player Deal". The Day. Associated Press. November 18, 1954. p. 1. Retrieved January 5, 2016. ^ a b Duncan, Ian (March 31, 2013). "Bob Turley, hard-throwing pitcher who played for Orioles and Yankees, dies at 82". The Washington Post. Retrieved September 21, 2013. ^ a b Wilks, Ed (August 29, 1957). "Bullet Bob Turley Slams Door On Top-Shot Bid By White Sox". Ottawa Citizen. Associated Press. p. 11. Retrieved January 5, 2016. ^ "Casey Names Turley; Alston Tabs Podres For Tomorrow's Contest at Ebbets Field". Oxnard Press-Courier. United Press International. September 29, 1955. p. 16. Retrieved January 5, 2016. ^ Antonen, Mel (October 21, 2005). "Starters strong suit for Astros and White Sox". USA Today. Retrieved September 18, 2013. ^ a b c Wolfe, Niki (March 30, 2011). "Turley Coming to Cy Young Days Festival". Newcomerstown News. Newcomerstown, Ohio. Retrieved March 31, 2013. ^ a b c d e McCarron, Anthony (October 21, 2010). "Former Yankees Cy Young Award-winner Bob Turley says Bombers should follow Derek Jeter's advice". Daily News. New York. Retrieved October 23, 2010. ^ "Bob Turley Recipient of Prized Hickok Belt". Gadsden Times. United Press International. January 25, 1959. p. 8. Retrieved January 5, 2016. ^ "'Young' Award to Turley". The Milwaukee Sentinel. Associated Press. November 13, 1958. p. 5, pt 3. Retrieved January 5, 2016. ^ "The Sporting News Pitchers of the Year & The Sporting News Major League Players of the Year". Baseball-Reference.com. Retrieved January 5, 2015. ^ a b c d e f Kimmey, Will (May 4, 1959). 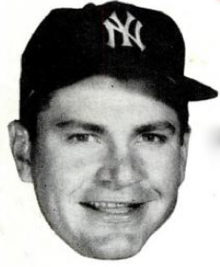 "Bob Turley, Yankees Pitcher". Sports Illustrated. Retrieved September 18, 2013. ^ Wilks, Ed (April 10, 1959). "Turley Faces Brewer In Stadium Curtain-Raiser Today". Meriden Journal. Associated Press. p. 4. Retrieved January 5, 2016. ^ "Houk's Mound Plan Gets Turley's Vote". The Milwaukee Journal. Associated Press. April 4, 1961. p. 2. Retrieved January 5, 2016. ^ "Yankees Pleased By Turley's Work". Toledo Blade. Associated Press. February 6, 1962. p. 22. Retrieved January 5, 2016. ^ Cuddy, Jack (June 9, 1961). "Ralph Houk Trying to Build New Yankee Pitching Staff". The Washington Reporter. United Press International. p. 14. Retrieved January 5, 2016. ^ Drebinger, John (June 6, 1961). "Yanks Take Double-Header and Send Twins to 10th, 11th Straight Defeats – Coates, Sheldon Triumph, 6–2, 6–1 Yankees Set League Mark as Blanchard, Mantle and Kubek Wallop Homers". The New York Times. Retrieved September 21, 2013. ^ "Turley Confident Surgery Success". The Milwaukee Sentinel. Associated Press. February 13, 1962. p. 2, Pt 2. Retrieved January 5, 2016. ^ a b "Bob Turley Traded To L.A. Angels". Prescott Evening Courier. United Press International. October 30, 1962. p. 7. Retrieved January 5, 2016. ^ Hackleman, Jim. "Yankees Whip Tigers The Hard Way (22 Innings): Seven-Hour Battle Record In Majors". The Tuscaloosa News. Associated Press. p. 10. Retrieved January 5, 2016. ^ "Players Ask Shortening of Schedules". The Bonham Daily Favorite. United Press International. July 10, 1962. p. 6. Retrieved January 5, 2016. ^ "Poor Average". Edmonton Journal. January 18, 1963. p. 9. Retrieved January 5, 2016. ^ "L.A. To Sign Bob, Not Sam". Daytona Beach Morning Journal. Associated Press. April 8, 1963. p. 3 Pt 2. Retrieved January 5, 2016. ^ "Seven player shift by Angels; Turley dropped". The Bulletin. United Press International. July 18, 1963. p. 7. Retrieved January 5, 2016. ^ "Red Sox Get Castoff Turley". St. Petersburg Times. Associated Press. July 24, 1963. p. 3–C. Retrieved January 6, 2015. ^ "Turley Becomes Red Sox Coach". The Pittsburgh Press. United Press International. October 19, 1963. p. 52. Retrieved January 5, 2016. ^ "Bob Turley Will Attempt Comeback". The Spokesman-Review. Associated Press. November 19, 1964. p. 16. Retrieved January 5, 2016. ^ "Braves Name Two". Herald-Journal. Associated Press. January 14, 1966. p. 15. Retrieved January 5, 2016. ^ "Bob Turley Quits His Baseball Post". The Tuscaloosa News. Associated Press. February 20, 1966. p. 14. Retrieved January 5, 2016. ^ "Former New York Yankees pitcher 'Bullet' Bob Turley still calls them as he sees them". Daily News. New York. June 19, 2010. Retrieved September 18, 2013. ^ Goldstein, Aaron (March 30, 2013). "Goodbye Gus Triandos and Bob Turley". The American Spectator. Retrieved January 5, 2016. ^ "Former St. Louis Browns Pitcher Bob Turley Dies". CBS St. Louis. March 31, 2013. Retrieved September 21, 2013. ^ New Jersey (September 11, 2013). 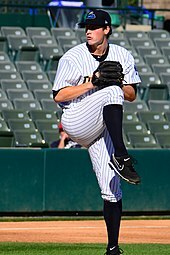 "Franklin: Trenton Thunder's Nik Turley has family tree rooted in athletes". The Star-Ledger. Retrieved September 18, 2013. ^ "Bob Turley, Pitcher With a Blazing Fastball, Dies at 82". The New York Times. Retrieved March 31, 2013.